Let’s create a lively, inspiring waterfront destination, that showcases everything that’s good about Govan and puts the city’s waterfront back on the map. During 2018, Collective Architecture worked with the local community to bring forward a Masterplan for Water Row – Govan’s prime development site. The exciting designs were published in January 2019. Use this page, like us on Facebook or follow us on Twitter to keep up to date with all opportunities to get involved with the ongoing transformation of Water Row. Upcoming events are detailed below and full project details are available here. Exciting designs have been published for the lively and attractive waterfront development to be created at Water Row, Govan. The proposals, which were shaped through a series of community consultations during 2018, will deliver stylish riverside flats and townhouses, together with smart commercial space at prime ground floor locations, all set amongst high quality streets and appealing new public spaces each with a different character to discover and enjoy. The Masterplan is set out in three parts: Part A – The Masterplan, Part B – its Appendices and Part C – the Stakeholder Consultation Report. Send comments and queries to [email protected], Orkney Street Enterprise Centre, 18 Orkney Street, Govan, G51 2BX. 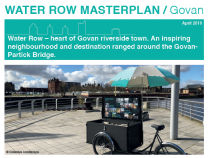 Summary proposals are available in the latest newsletter, which was delivered to nearly 3000 homes in and around Govan town centre in January 2019. 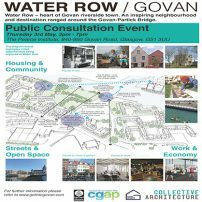 Join us next Saturday at Govan Family Fun Day for the first chance to view the proposed plans for Water Row. 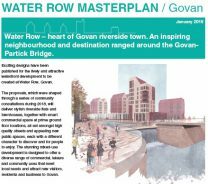 Consultation and design has been ongoing since December last year to bring forward plans for a lively and attractive waterfront development at Water Row that will put Govan back on the map and transform local livelihoods for the better. Representatives from Collective Architecture and the Water Row Masterplan Steering Group will be on hand on the day to explain how the preferred design option has been reached taking account of the many differing views and priorities that have been raised along the way. We hope to be able to circulate the final Masterplan report in the autumn. Look out for our tricycle with a scaled model of the Water Row development amidst all the other fun activities taking place on the day. We’d wheelie like to see you there! 132 people joined Collective Architecture and the Masterplan Steering Group to find out more about the emerging design for Water Row on 3rd May 2018. Development options for the site were presented to the public for the first time at this event – you can find all the display boards here. The different design options have been informed by a huge amount of consultation with local people and groups that has taken place over the last three months and we’d like to thank everyone who has contributed to date. 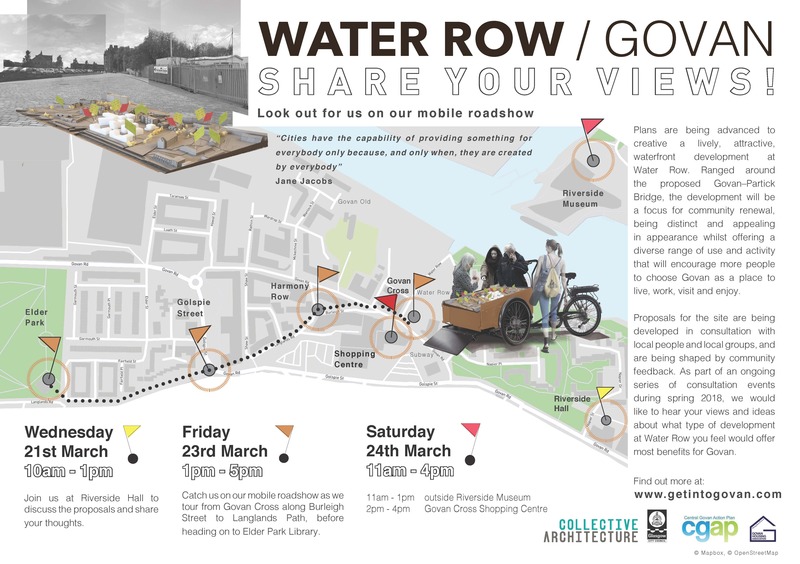 We are keen to get your views on the design and look of the development at Water Row about all the uses you’d like to see there and how you feel these new uses and activities could bring real benefits to Govan. You can still comment up to 18 May 2018. Send your views to: [email protected] If you are looking for more information meantime you can catch up with the Water Row Masterplan Newsletter April 2018. This was delivered to more than 2700 homes in Central Govan during April to help keep everyone up to date.